You share a computer with other people. This is not a problem thanks to the various password-protected user accounts. But selecting a secure password is difficult. 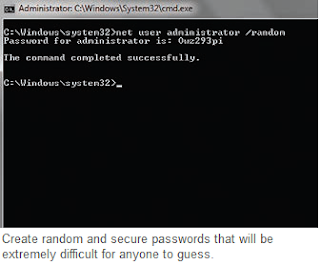 You can create random passwords for individual user accounts. These passwords can contain upper and lower case alphabets, digits as well as special characters so that they are generally secure, even if eight characters seems to be relatively few. Right click the start menu, go to ‘Start | All Programs | Accessories | Command Prompt’ and select the command ‘Run as Administrator’ in the context menu. You must authorize this command by selecting a user account with administrator rights and entering the relevant password. Then enter the command net user / random after the prompt. Replace the ‘user name’ with the name of the user account for which you want to create a password. For example if you want to create a password for the account ‘Erick’, then use ‘net user Erik / random’. Confirm with [Enter]. NOTE: Windows creates the password, displays it in the prompt and allocates it to the specified user account immediately. You must thus note the displayed password. You will not be able to log in to the relevant account without the password. Therefore, you must always have at least one account with administrator rights whose password is not randomly generated. You can use this account to override the passwords of all other user accounts by allocating new passwords in case of emergencies.